The School places great emphasis on the values of wearing the correct uniform and dressing appropriately. Wearing a uniform is a badge of pride, creates an identity for the school and is an important part of being a school student. A school uniform teaches students to dress smartly and take pride in their appearance. A uniform diminishes economic and social barriers between students and helps keep students focused on their education, not their clothes. The color of the pinafore should be the approved mocha color. The zip on the back of the pinafore should run from the top of the pinafore till the cut where the box pleats start. The box pleats should start from the bust area of the pinafore. 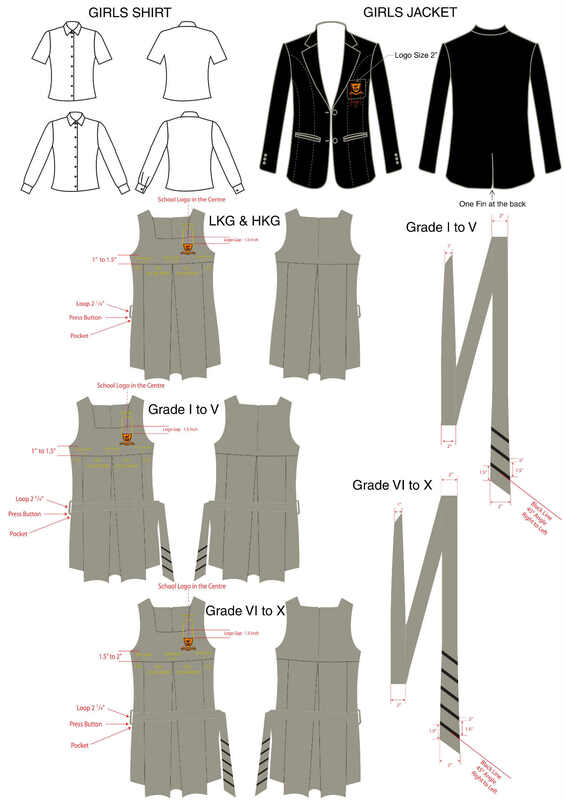 This should be 1 – 1.5 inches below the underarm cut (for the shirt sleeve) of the pinafore for Grades 1 to 5 and 1.5 – 2 inches for Grades 6 to 10. Box Pleats size: Measure the breadth of the pinafore from side to side. Divide this into 3 parts. The size of each box pleat will be one part, thus the size of the 2 box pleats will be 2 parts. The third part will be split as the 2 gaps between each box pleat and the side. The same should be followed for the 2 box pleats on the back of the uniform. The school logo will be placed on the left side chest area of the pinafore just below the shoulder strap. The centre of the logo crest should be below and in line with the inner edge of the shoulder strap. The logo crest should be 1.5 inches from the bottom edge of the shoulder strap. There should be a loop to hold the sash in place on the right side of the pinafore. The loop should have a press button fastener on the bottom while the top end of the loop should be stitched to the pinafore. The sash will be worn around the lower end of the waist of the student so the loop needs to be positioned accordingly. The knot and loose ends of the sash should fall on the left side. The pinafore will have a pocket on the right side just below the sash hook. The length of the pinafore should be till just below the knee of the student. The depth (back fold) of the box pleat should be 1.5 inches for students of LKG to Grade 5 and 2 inches for students of Grades 6 to 10. This applies to the box pleats in the front and the back. The colour of the sash should be mocha brown, same as the pant and pinafore, with black stripes. Sash has to be worn by students of Grades 1 to 10. LKG and HKG students do not need to wear a sash. The width of each stripe on the sash should be 0.5 inches. The gap between 2 stripes on the sash should be 1.5 inches. The sash should have a slant cut at both ends (same slant angle at both ends). First stripe should start 1.5 inches from the bottom of the broad end of the sash and parallel to the slant cut of the sash. Stripes on the sash should run from top right to bottom left. The sash should be long enough so that the broad end of the sash falls till the knee of the student and the narrow end of the sash falls halfway between the knot and the knee. The broad end of the sash should be 2 inches. The narrow end of the sash should be 1 inch. The rest of the sash will be 2 inches wide. Short leggings/tights should be compulsorily worn by all girls and should only be black. They should be 1 inch above the hem of the pinafore and SHOULD NOT be visible when the uniform is worn. The color of the shirt should be white. The school logo will be placed on the left pocket of the shirt for boys. There should be no school logo on the shirt for girls. Shirts may have long or short sleeves. Full sleeved vests may not be worn underneath short-sleeved shirts. The color of the pant should be the approved mocha color. Elastic pants will be allowed only for students of classes LKG to Grade 5. Students of Grades 6 to 10 will NOT be allowed to wear elastic pants. The pants can be flat fronts or have 1 pleat. The pants should be sufficiently lose and should not be slim fit. The color of the tie should be mocha, same as the pant and pinafore, with black stripes. Stripes on the tie should run from top right to bottom left. Stripes on the tie should be parallel to base slant of the tie. First stripe should start from the bottom of the tie, 1.5 inches from the base. The width of each stripe on the tie should be 0.5 inches. The gap between 2 stripes on the tie should be 1.5 inches. The bottom width of the tie should be 2.5 inches (for smaller length ties), 2.75 inches (for medium length ties) and 3 inches (for longer length ties). Velcro ties will be allowed for students of Grades 1 to 5. LKG and HKG students do not need to wear ties. Grade 6 to 10 students will need to wear full length ties. The material used for the tie should be the approved material. The colour of the blazer should be black with a sheen. The school logo will be placed on the left blazer pocket on the chest of the blazer for both boys and girls. The chest pocket with the logo should have rounded edges at the bottom corners. The blazer should have 2 buttons. 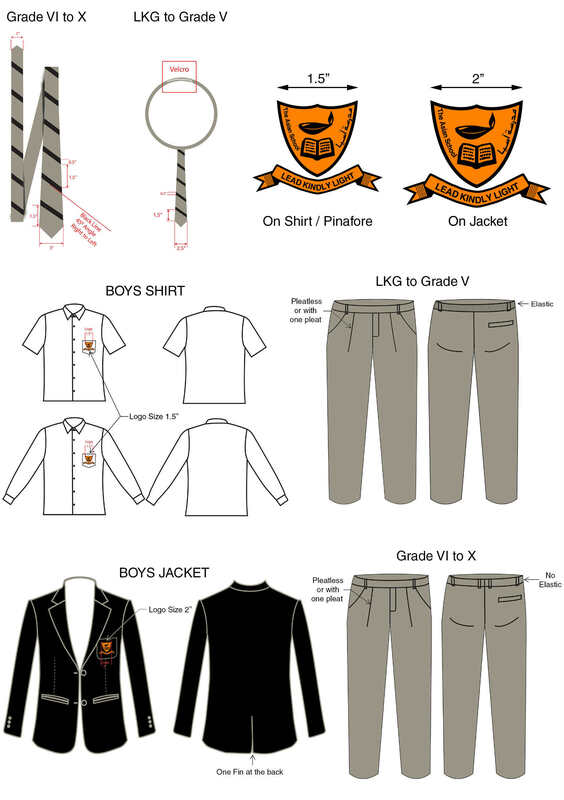 Blazer should be worn by students of Grades 8, 9 and 10. The back of the blazer should have 1 cut (fin) in the bottom middle. The bottom edges on the front base of the blazer should be rounded and NOT square. The size of the logo should be such that the gap between the 2 points of the crest is 2 inches. The breadth will be as per aspect ratio. The size of the logo should be such that the gap between the 2 points of the crest is 1.5 inches. The breadth will be as per aspect ratio. Sweaters or cardigans should only be plain simple black with no designs. Hooded sweaters and cardigans will NOT be allowed. Woollen caps may be worn in the winter while outside but must be removed when indoors. Headscarves should only be plain white with no designs. They should be worn short in such a manner that the tie and school crest is visible. A SIMPLE black leather belt must compulsorily be worn by boys of Grades 6 to 10. Only flat, plain black leather shoes with no designs will be allowed for boys and girls. Only plain white socks will be allowed for all and they should not have any other design or colour on them. Ankle length socks will not be allowed. Full length white stockings may be worn by the girls during winter. (White tights tucked into white socks or the other way around is unacceptable). To be worn only on every Sunday. T-shirts should be long enough to be tucked into the pant/skirt. Boys: Plain white shorts 4 inches above the knees during summer or plain white trousers during winter along with white t-shirts adorning the school logo. Girls: White divided skirts with box pleats (knee length) and white t-shirts with the school logo. The color of the skirt should be white. The skirt should have 2.5” pleats. The zipper can be at the back or on the side. The waist band of the skirt should be elastic. Plain white sports shoes and white socks. No fancy shoes will be allowed. Uniforms must be neat, clean, and free from stains, wrinkles, holes, and bad odour. Haircuts for boys should be short and neat, off the ears and collar. Girls with short hair must wear a white hairband. Girls with hair below shoulder length should make two plaits, tied with white ribbons. Unconventional hairstyles are not acceptable. Students may not dye or highlight their hair in any way. Students must keep their nails clean and trimmed. Girls may wear small, simple studs. No other ornaments will be allowed in school. Absolutely no make-up will be allowed, including eyeliner or kajal and nail polish.